Have stinky sinks, scratched hardwood floors or temperamental toilets got you at your wits’ end? Get ready to tackle 15 deceptively simple common home improvement problems. Laundry rooms, basements and other utilitarian areas may have exposed pipe areas. And while that’s not a big deal most of the year, when the thermometer drops, these pipes can be prone to freezing up. A simple solution: install heating cables and insulate them. Simply run the cables up the pipes, using electrical tape to attach every few inches. After the cables are attached, cover them with insulating foam, and plug in the cord. The first step to non-stinky washers is prevention — moving clothes out before they get musty may be easier said than done, but will go a long way toward a fresher washer. Leave the door open to let the washer itself air out after loads, as well. But there are other measures you can take. First, clean the door’s rubber seal with a half-and-half solution of water and vinegar about once a month. Also, run a cleansing cycle in the wash, where you run it on the hottest cycle with the tub empty except for a cup of baking soda in the drum, and using distilled white vinegar in the detergent dispenser. Finally, clean your drain pump filter every few weeks, per your washer’s instructions. When the toilet isn’t working, it’s an urgent household matter. And there’s no reason to wait for a repair worker on something like a broken flush arm: you can do it yourself! Remove the tank lid and unhood the lift chain. You’ll need a crescent wrench to remove the nut inside the tank that holds the old handle in place. Once you’ve removed the old handle, take it with you to the home improvement store to make sure you get a new one that will work with your toilet. Then attach the new flush arm according to the directions in the package … but you should be a pro by now, since you already took out the previous one, and it’s just the reverse process! Just make sure you do some test flushes so you know the chain isn’t too loose (keeping the tank from fully draining) or too tight (causing leaks). Once you get it properly adjusted, put your tank lid back on, and you are ready to flush in style! While that gouge in your flooring looks horrible, odds are that it can be fixed without a complete overhaul of your hardwood floors. Basic scratches can be concealed with stain markers that match the color of the wood floors. This is more of a camouflage than a true fix, but it makes them much less visible. For deeper scratches and gouges, try paste wax. Rub some of a matching color into the scratch, then polish off the excess after it has dried. Acrylic wood filler can be used for gouges greater than 1/4 deep, but you have to wait four hours between applications. Just remember these are for spot-fixes — if your hardwood floors have all-over scratches and damage, your best bet is probably a full refinishing. So you’re moving along on your home improvement project, removing screws with your drill, and then you hear that tell-tale whirrrrrzzzzz! sound that means you’ve hit that DIYers’ eternal pain: a stripped screw. If the screw isn’t flush with whatever you’re removing it from, there’s always the option of pliers, which is probably the most direct. But if it’s screwed in tight, find some heavy-duty rubber bands. And not just one — you’ll probably need a few rubber bands to get out a really well-stripped screw. But laying a rubber band over the stripped screw’s head should give your drill or screwdriver enough traction to eventually remove that stubborn screw and move on with your project. Leaky faucet? Do a quick Internet search of your faucet’s make and model to determine whether it’s a chronic problem or a possible one-time fix. Amazon.com reviews and online forums can reveal clues about whether O-ring or cartridge replacements are worth the time. Spare parts (if not antique or specialty) will almost always be significantly less expensive than a brand new faucet. It requires a good number of tools, but repairing a vinyl tile is really not complicated. First, loosen the adhesive on the damaged tile with a heat gun or warm iron, then take a putty knife and gently work the tile up off the floor. It usually works best when you start at the corners and work your way to the center; the tile is less likely to tear that way. Make sure your room is well-ventilated, then use mineral spirits to soften the adhesive on the floor from the old tile so you can more easily scrape it away with the putty knife. After the surface is fairly evened out, apply the new adhesive. Lay the new tile on the adhesive and secure it by rolling over it with a rolling pin. After the tile is in place, wipe away any excess adhesive with a mineral spirit rag. Let the tile dry and get really well and fully stuck for a few hours (or as per adhesive instructions), and you’re done! If your fireplace seems to be too much smoke and not enough fire, check your damper before you fret. The damper is the steel or cast-iron door at the top of the firebox, and it is critical to keeping your fireplace working effectively. Clean your damper with a firm wire brush. Be sure to wear safety goggles and some type of face mask to keep all the old particulates out of your eyes and lungs. Also, this will be a dirty job, so don’t head into it wearing your Sunday best. Remove the soot and rust buildup with a lot of scrubbing, then finish off with a bit of WD-40 or similar lubricant on the hinges. 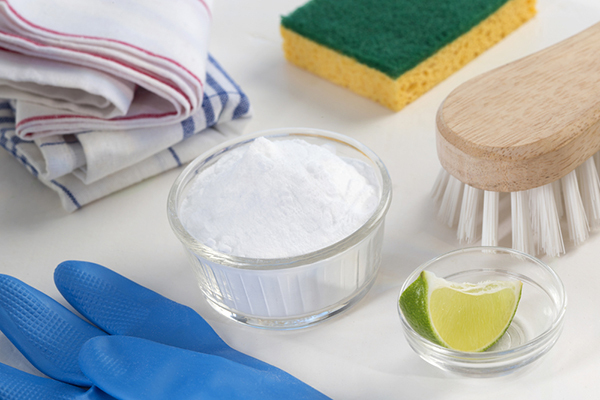 Forget putting the lime in the coconut — to get these intractable white stains out of your sinks, go with the vinegar to beat lime. Soak paper towels in vinegar and apply them to the areas with the lime-deposit hard-water stains. One caveat: this may discolor brass or colored fixtures, so proceed with caution when you are cleaning around those styles of drains. Tired of missing package deliveries or your friends having to knock when they arrive? Fixing your doorbell is probably easier than you expect. Remove the screws that hold your current doorbell in place and remove the pushbutton. Disconnect the wires from the button, then touch those wires together. If you hear the doorbell, you’ve got an easy fix! Just buy an inexpensive replacement and install it per instructions, and ring-a-ding-ding, your doorbell works again!